Carolina Cockapoos is a small Cockapoo kennel dedicated to breeding only Cockapoos ! We live near Hickory, N.C. in a little town called Connelly Springs, N.C. feel free to call Barbara or Heather @ 1-704-271-3349 we are a mother & daughter team. We breed Toy size Cockapoos that are mostly 8-12 pds . Cockapoos are a hybrid breed, a poodle mixed with a cocker spaniel. We raise only 3rd & 4th generation Cockapoos , We start with parents that are temperamentally sound, healthy and beautiful, In addition, we have all of our parents tested for Cerf which is the Eyes, Patellas which is their rear knees because our belief is if you start with healthy parents you end with healthy puppies. We prefer to stay small only have a few litters each year so we can give them lots of attention as they are very affectionate creatures ! All of our babies are born in our bedroom and stay there until 3 weeks old and then we take to the utility room there they are in a large crate attached to a exercise area and then they start to get curious about what mom is eating and drinking – moms are great teachers ! All puppies come to you with extensive socialization skills as we have 4 grandchildren that live next door to play with them every day as this is very important especially if you have children in the home also we spend time daily playing and socializating them as we never get to old to play with puppies ! We do not sell to homes that have children under the age of 5 due to our babies being so small when they leave us and can get hurt easily. We also offer boarding for $10 per day if you can’t pick up your puppy on the designated day and only if our schedules permits – pick ups are always on Saturdays. 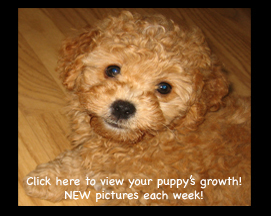 Your puppy come with a record of their vaccines & wormings, a 1 year written health and genetic guarantee as well a spay & neuter contract and a copy of their AmericanCockapoo Registration papers. Many go on to be therapy dogs in nursing homes and schools and hospitals. We will gladly provide you with references. Cockapoos have been around since the sixties and become popular because they are so outgoing loving intelligent sweet natured creatures and the fact that they shed very little which is great for those with allergies. The resulting personality is unique in their ability to relate to people and children. They are famous for being affectionate open and friendly eager to please as well as easily trained they also have longevity. We reserve the right to refuse the sale of a puppy to a home where we don’t feel it will be properly cared for and loved. Under no circumstances will we sell to pet shops or brokers. We no longer offer shipping -sorry. We do not allow visitors until the puppies have had both of their vaccines due to diseases that could be deadly to our puppies and upon advice from our vet but we update pictures every 2 weeks. We also reserve the right to keep pick of the litter of any of our female puppies for future breeding purposes. For more information regarding any of our policies guarantees etc., please feel free to call or e mail us.